Rob Roy made it safely past St Anthony's. 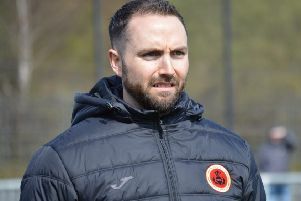 Rob Roy made heavy weather of seeing off West of Scotland Cup opponents St Anthony’s in torrential rain at Guy’s Meadow on Saturday. But in the end Stewart Maxwell’s side did enough to book a place in the second round and another home tie with Thorniewood United. Lower league Ants went close to a shock opener in the sixth minute when Shaun Gallacher saw his volley hit the topside of the bar and go over. But in the 12th minute Rabs also had an effort hit the bar - and it led to the opener. A Gavin Mackie shot rattled the woodwork and with the Rabs players being more alert to the second phase, Joe Slattery’s cross from the right was headed in at the back post by Gary Carroll. St Anthony’s responded and Roy keeper John Hutchison made a mess of a cross from the right before, at the other end, Connor Hughes’s cross from the left was too strong for his team mates. In the 17th minute Ants keeper Owen McCallum made a great save from Carroll, but was scrambling two minutes later as Graeme Ramage’s left foot shot went narrowly past. McCallum then saved a curling free kick from Ramage and then a surging run down the right from Young ended with his shot going narrowly past the right hand post. However Ants were dangerous on the counter and John Ball saw his effort blocked after a break from striking partner Scott Arthur. Five minutes later clever play from Ramage saw his cross put into the net by Hughes but referee Gentles ruled the effort out for offside. Michael Tuohy saw his goalbound shot deflected over in the 37th minute, but a minute later it was 2-0. McCallum made a great save from a Carroll free-kick, but Ramage was quickest to the loose ball and weaved past three defenders before calmly dinking the keeper. The Roy increased the pressure and efforts from Tuohy, Ramage and Jordan Currie-McLean all went close before the Ants broke again and Hutchison did well to save Mark McIlvaney’s shot. After the break a Hughes effort went wide before Slattery curled a shot over the bar. The pressure continued. Carroll shot over after being set up by Slattery and substitute Alberto Vezza had an effort blocked for a corner from which Carroll heading over Mackie’s cross. McCallum saved Currie-McLean’s effort and then did well to keep out Vezza’s strike for a corner kick. Then from a Ramage cross Vezza headed over and a minute later his effort hit the bar as the Ants struggled to cope with the energetic striker. Substitute Willie Sawyers headed over before in the 72nd minute the Ants were given a lifeline when the referee penalised Michael Daly for holding Arthur in the box and Mark McIlvaney shot low past Hutchison from the penalty. As the rain came down in torrents, the Roy pushed forward and Vezza’s spectacular overhead kick was narrowly wide. McCallum saved well from Currie-McLean, but the keeper was eventually beaten in the final minute when Ramage sent Currie-McLean free on the right and his surging run ended with a powerful shot that flew high into the net.